YouTube, the video-sharing website owned by Google, will create a special section dedicated to K-pop for the first time, a move the government hopes can further promote Korean popular culture around the world. 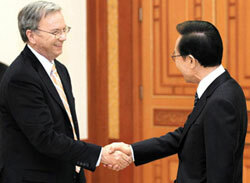 Eric Schmidt, Google's executive chairman, met with President Lee Myung-bak in Cheong Wa Dae on Monday. He said the company is pursuing several avenues to help spread Korean cultural content, of which a dedicated K-pop channel is one. Schmidt said Google is also considering using YouTube's live streaming capabilities to transmit Korean Wave concerts in real time. Another idea being mulled is the creation of a film production studio for small and mid-sized content developers in Korea. More than 5 million K-pop videos have already been uploaded on YouTube by fans, including 400,000 featuring boy band TVXQ, 400,000 of all-girl dance group Kara, 340,000 for Girls' Generation, 270,000 by Super Junior and 260,000 by the Wonder Girls. But when searching under the key word "K-pop," only 600.000 videos appear as they were uploaded on different channels according to the various management companies, musical groups and individuals that shared the content, making it harder to search for specific content. This will all change with the creation of the "K-pop channel," which will link the names of each performer to make searches on YouTube easier and more comprehensive. "YouTube played a huge role in attracting fans to this musical genre from around the world," said a Cheong Wa Dae official. "The creation of a K-pop channel will further enhance its clout and influence." Management companies welcomed the move. A staffer at a mid-sized management agency said, "It will be a big help for small management agencies [like us] which cannot easily take their singers overseas to perform or put on big shows, as their singers will be featured on the same forum as Girls' Generation, Big Bang and other bands that are hugely popular." SM Entertainment, YG Entertainment, JYP and other local talent management agencies have been actively utilizing YouTube for promotional purposes. SM has a special on-line management team staffed by 10 employees to govern its content on the site, while JYP has separate teams of three to four workers who handle YouTube content for individual performers. "Uploading one video on YouTube is better than spending W1 billion (US$1=W1,117) on advertising, and this effect will become more pronounced when the K-pop channel opens," said Noh Seung-wook of JYP. YouTube allows videos uploaded by a particular company or individual to be gathered in one place. This can be done by adding tags such as "/smtown" or "/YGEntertainment" after the site's address. Initially, K-pop coverage on the site appeared in the form of blogs containing individually uploaded videos, but various editing functions have since become available prompting famous artists, music labels and movie production companies to use the platform as a more effective advertising tool.